Oh friends, I wish I could meet you at the door of the new cafe, pour you a fresh cup of coffee and give you the most delectable cupcake. We could have a seat and talk for hours! I so wish that was true. I want to share with you today some shots of the cafe. Friday night we were open for a sneak preview and gave out samples of the goodies. I almost missed it, having come down with the flu on Thursday, but I was able to attend for a bit - the result of much prayer. The official opening date is March 12. Everywhere you look is cuteness and creativity. We had pendant lights made out of vintage cake carriers. I spent some time yesterday drawing on the chalkboards with chalk markers - teacups, cupcakes and curliques - along with the menu of course! My window display made the front page of the local newspaper on Friday. It was like getting asked to the prom by your dream guy! I'm so happy that customers love it! The building is a historical building which has been taken care of wonderfully. The floors are gorgeous! 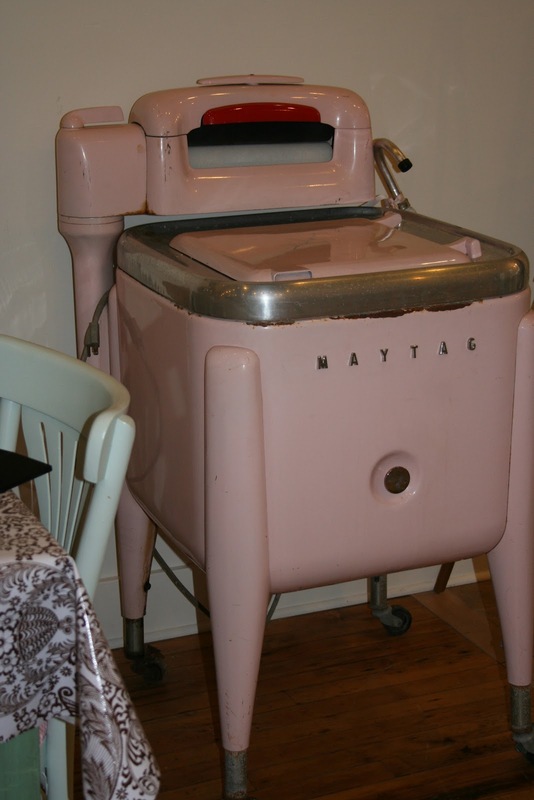 The vintage Maytag washing machine always stirs a ton of interest. People take pictures of it and share their memories of their moms washing with one. I pray that God will bless the work of many hands as we embark on this adventure. To see our newest chef/baker go here. That is an amazing story for another day! I am so glad you are feeling better and thank you so much for sharing these pictures with us. Such a sweet location! Oh Renee such a lovely shop.The window is ohhhh so sweet. cute place! Love the pink washer! Oh goodness so many wonderful things happening in there! 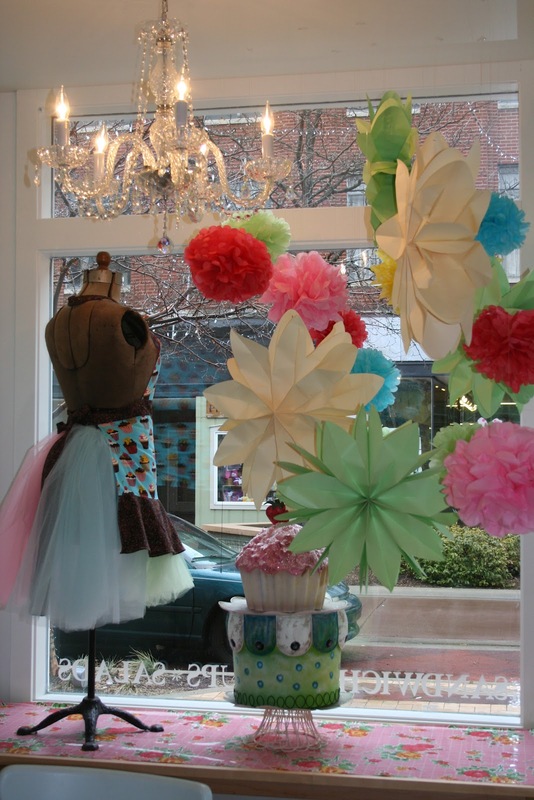 The window display you did, looks sooo adorable! and I LOVE the light fixtures! Those are so neat and creative. The floors are gorgeous, I love old wood floors!! Glad you're feeling better, Take care! Oh my goodness ... It is simply divine, Renee. I would love, love to drop in every day for coffee and cupcakes. Here's wishing you many years of success! Oh! It is so lovely!! I wish much success in this endeavor!!! Oh what fun it would be to walk in the door and suprise you. That is just the kind of place I love. Too bad you are so far away. Congrats on getting your window display in the newspaper. I love those floors and the decor is adorable. Will you be working there too? Best wishes on the grand opening. I didn't know you were going to open up a cafe! It looks wonderful! We will have to take a drive down to Kalamazoo for a coffee :) I hope you have wonderful success! What an exciting adventure for you Renee. The place looks darling and I can bet the cupcakes are amazing. I love that pink vintage washing machine and the lighting. So cute! 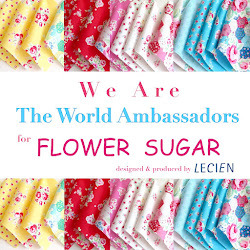 Hi Renee, I love your shop-everything about it is perfect! The window display is adorable, I'd love to come visit and have a cup of coffee. I didn't realize you were opening it, the best of luck and success to you. Oh how fun! The shop is just adorable and I wish you much success! Oh, what a delightful post! Thank you for sharing this adventure with us! I wish you well and ask God to bless the work of your hands. Oh. my. goodness. Where is it located?? I would so love to come visit. LoVe the cake tin lights. Hmm. It would be so much fun to meet you and Shann at the darling new cafe!! You did such a great job! Hope you are feeling better again. Blessings! How sweet! May the Lord bless your new shop! Love the window display!!! You are so creatively talented (blessed). Wishing you very much success in this and all your endeavors. Sharing a cupcake and coffee if only in spirit. 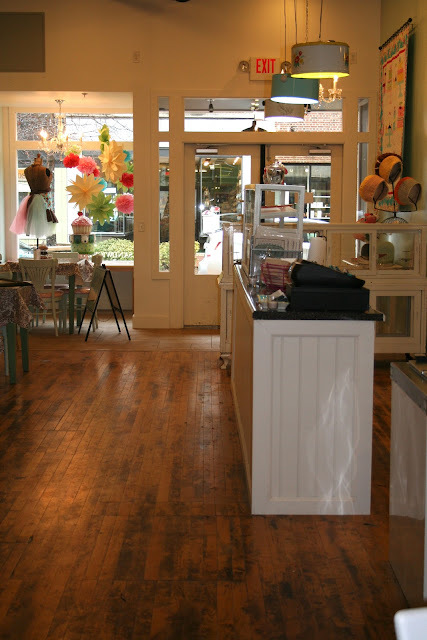 What an adorable shop...with the store front and the wooden floors. I love those kind of shops. Never mind that you probably get the sweetest cupcakes in the world!! How exciting for you to be part of such an endeavor and I pray that it is successful for all involved. I love the shop! I wish I lived close enough to stop in! I can't wait to hear about the grand opening! This is so sweet--wish I were close enough to visit it!